When selling your home in the modern day, there are multiple options available to you that are vastly different from the traditional way of selling your property through a traditional real estate agent. You might not have realized the numerous advantages of selling your home in an auction as an alternative method. Auctions have become increasingly popular and can be a smart, efficient way of selling your home in a wide array of markets. With the possibility of a bidding war arising in the unique atmosphere of an auction, there could be no ceiling for how high your property can sell in a competitive market. Auctions oftentimes motivate people to spend more than they typically would in a standard sales environment as it allows for emotions to run high. Emotional bonds to your property can increase your home’s value in a strong seller’s market. Strong sellers’ markets aren’t the only time in which auctioning your home can be ideal; selling your home in a slow market can be quite beneficial as well. In a tough market, the best strategy is to try to sell your home as quickly as possible before your home becomes too undervalued and remains on the market for too long. To achieve a true market value before your home’s value declines even further in a buyer’s market, consider selling your home quickly and effectively through a real estate auction. The way that auctions are typically organized ensures that only serious buyers are showing interest in your property. Auctions get potential buyers into a competitive market and prequalify bidders before entering the real estate auction. Only serious buyers will be involved in the bidding process and are oftentimes required to provide a deposit immediately after achieving the highest bid. The longer you hold onto your property, the increased costs you face as a homeowner. Selling your home through a real estate auction expedites the process and gives you an exact date to plan and budget around. Savings on mortgage payments, taxes, and home maintenance can be accrued, and allow you to create a structured financial plan. When utilizing a focused marketing strategy within a condensed time frame, your efforts will be optimized. A highly-targeted campaign will allow you as a homeowner to attract the maximum number of buyers in the minimum amount of time – saving you time and money. Condensed marketing campaigns increase the likelihood of potential purchasers seeing your ads and developing emotional connections to your property. 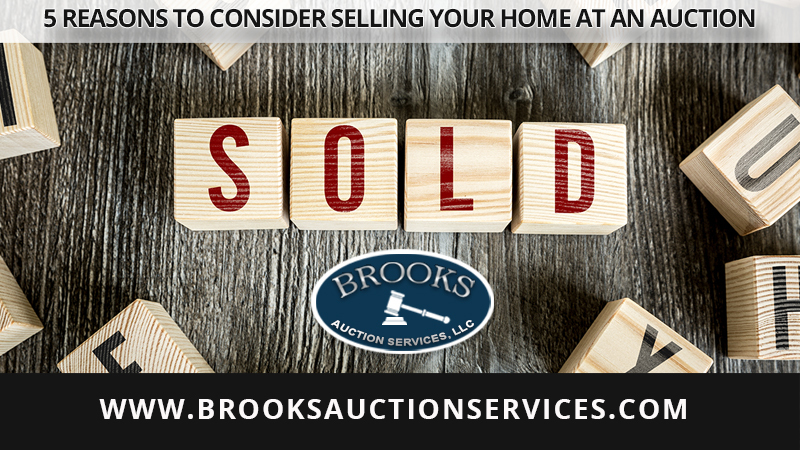 For Southeastern real estate auctions in South Carolina, Georgia, North Carolina and Alabama, look no further than Brooks Auction Services. We have the experience and expertise you need to maximize your property’s exposure and sell at the best price possible. Our services and unique marketing strategies are the answer to selling your property, land, or equipment in the local area. If you would like to be featured in one of our auctions, call us today at 864.379.1011 or fill out our online contact form to learn more.